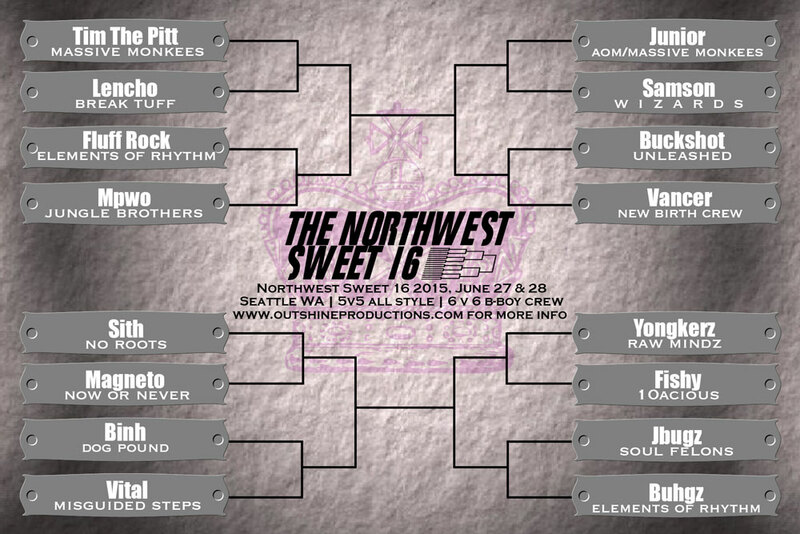 The Bracket for the Northwest Sweet 16 2015 Championship!!! I haven’t been this excited for a bracket in a long time. This year’s bracket will be full of surprises with new and returning faces. Several notables include Tim the Pitt’s return, our first ever champion’s return (Junior), Jbugz, and Vital. We will have a bracket that you can fill out at the event, with the winner receiving a cash prize. This entry was posted in Northwest Sweet 16 and tagged 2015, brackets, championship, Northwest Sweet 16, seattle break-dancing events by timuomoto. Bookmark the permalink.